Suitable for use on link roads, squares , avenues with intense traffic and crossroads. Suitable for use on squares, avenues with moderate traffic and crossroads. 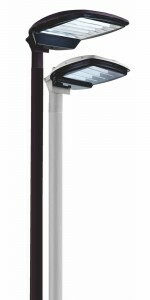 MARANELLO can be pole,arm and wall mounted, as single or double units, providing great installation flexibility. The head is attached either directly or using an adjustable spigot, both suitable for diameters 64mm an adaptor.MARANELLO has a maximum weight of 10 kg, and L of 18 kg.